Our team of crack researchers pored over websites and called numerous vendors to get current prices on things like coffee dates, new outfits and apology flowers to properly represent the cost of modern courtship. Then we turned our attention to budgeting the perfect frugal wedding. We made sure to choose median costs for items, and not create a top-dollar scenario - after all, we were appealing to the average Canadian, not the Kardashians. We crafted a news release that frequently mentioned our rate comparison client, with an eye to building valuable links back to the site. Based on a targeted media list we built specifically for this campaign, we emailed hundreds of releases to newspaper, radio and TV assignment desks/producers. We made a few phone calls to top personal contacts we had in various newsrooms. 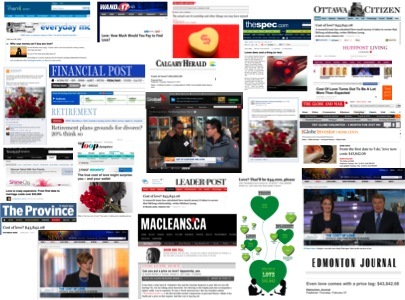 Before we had the chance to spend hours cold-calling media, the story grew legs, went viral, and the next thing we knew, it was everywhere in print, on TV and the web, including The Huffington Post, Global Morning Show, The National Post, The Globe and Mail. As a result of our stellar writing, our knowledge of what appeals to media, and the catchy way we put it all together, we garnered over two million dollars of ad value/ROI for our client. 7 television, 20 radio, 68 online, and 9 in print. In those 104 hits, the client was mentioned by name (and URL) 145 times. In the 68 online hits, there were 36 active links back to the client. We expect this story to resurface on its own come spring, as Canadians are planning weddings. Who knew – we’re not only a top PR firm, we’re also relationship experts!